All those billions of dollars ... and disastrous incompetence. Can you imagine any private company surviving with similarly bad performance? The TSA costs us over $7 billion a year – every year since 2002 – and it accomplishes ... utterly nothing. Zero terrorists captured or identified. Zero terrorists stopped. Zero terrorist weapons captured. But millions upon millions of travelers inconvenienced and delayed. 1. It pacifies low-information voters, making them believe they're being protected. 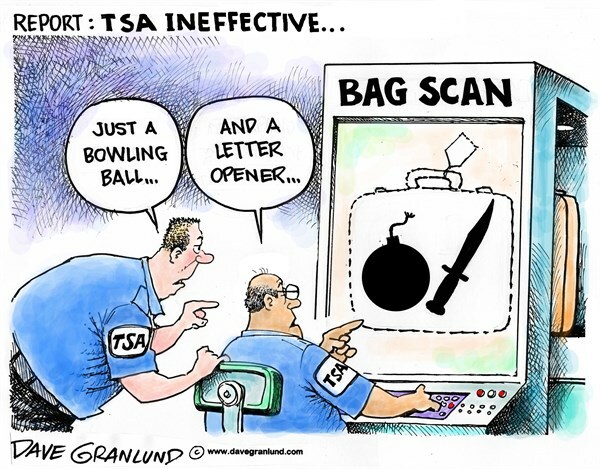 The vast majority, unfortunately, do not understand the TSA's profound uselessness. 2. It employs hundreds of thousands of people on the government payroll – and they can be counted on to vote for Big Government, just as other large groups of public sector union members do. Also, their union can be counted on to contribute major sums to the Democratic Party and its candidates, thus guaranteeing continued support from them.